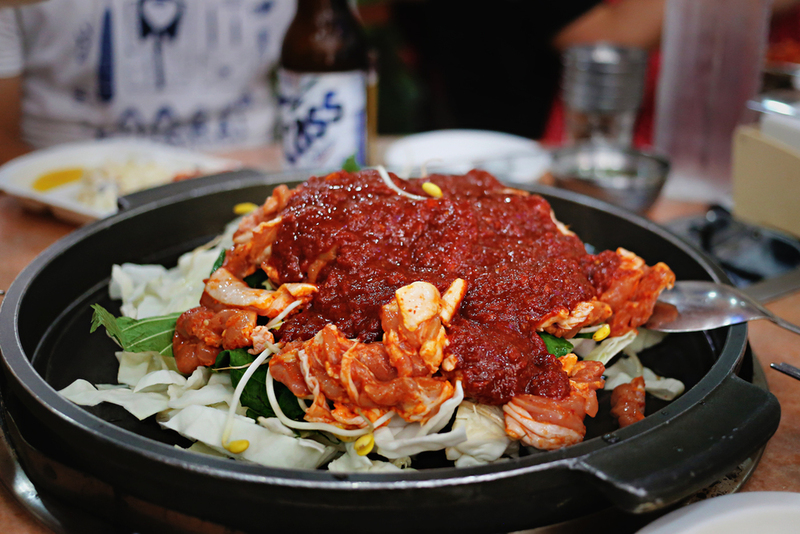 Chuncheonjip Dakgalbi Makguksu (춘천집닭갈비막국수) is one of the popular places around Sinchon area to eat Dakgalbi. 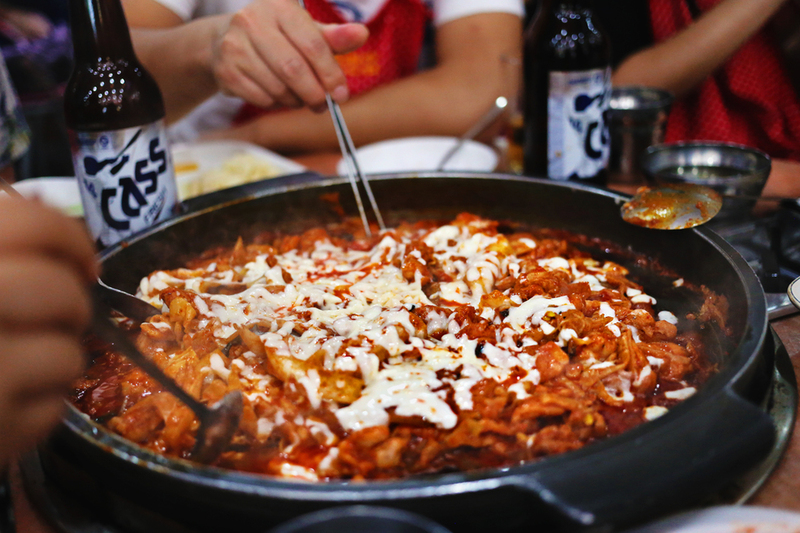 The food is good and the price is affordable too (costs around 6000-8000 won per portion). This place is also popular amongst the locals and also tourists, so if you come here, the staff can help you order too (I think they can speak basic phrases for ordering in Chinese and Japanese). 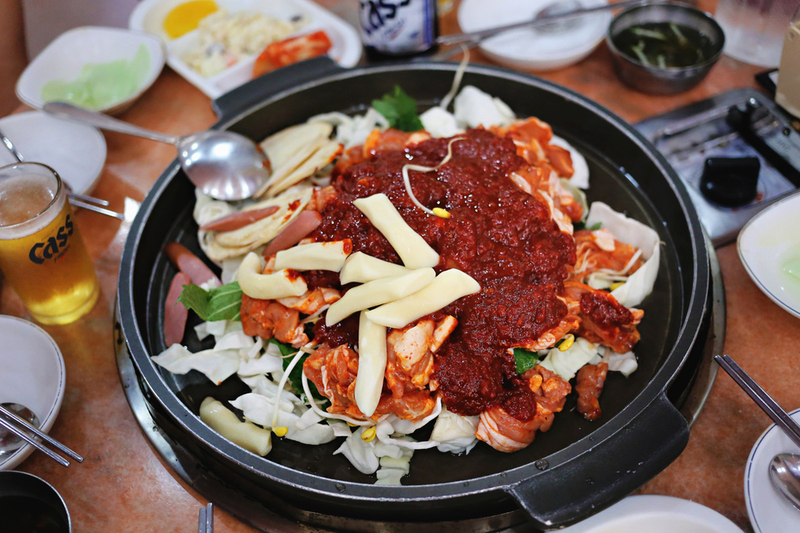 We ordered the cheese dakgalbi and it wasn't too spicy. So for those who can't handle spicy food, this would be a good choice. After ordering, the staff brought us banchan and we waited for a couple of minutes for the food to be ready because it involved a couple of steps when they cooked the food. First they put all the food items on the grill pan, mixed them when they're cooked, and added cheese in the end. But they pretty much did all the cooking. So all you need to do is sit back, relax, and wait for the food to be ready. Sinchon Station (Subway Line 2), Exit 1. Turn right onto the first side street (Hyundai Department Store). Go straight for 130m and cross the street. The restaurant is next to Changcheon Children's Park (창천어린이공원).